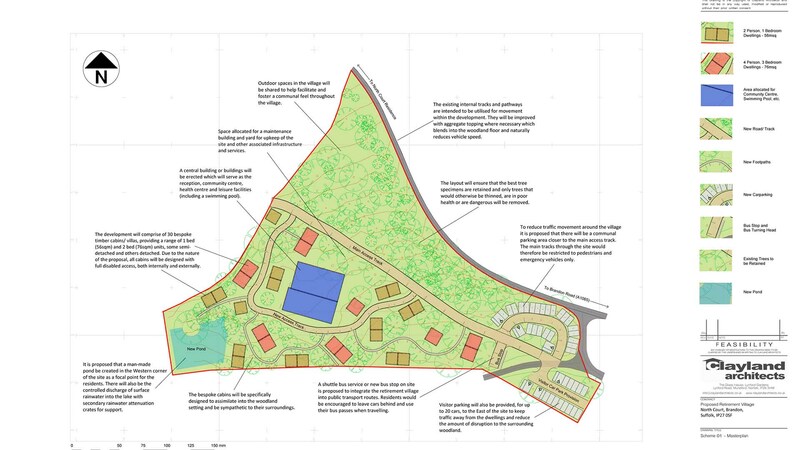 A long standing client asked us to look into the feasibility and development of a Retirement Village within woodland on the outskirts of Thetford Forest. This innovative proposal has gone through an in-depth design feasibility stage including involvement and feedback from the local authority. This proposed village of 30 ‘assisted living’ villas will be designed to be sympathetically distributed around the existing woodland, being encompassed by the natural environment rather than removing it. It is envisioned that the site will become a quiet and serene place for people to retire to. With facilities to provide health care, support and leisure, alongside comfortable and safe living in a woodland setting, the proposal has drawn inspiration from several holiday parks in the surrounding area which provide a certain experience and ethos for visitors which we believe would work very well as a retirement village.